In Australia it is Survival Day – also known as Invasion Day, Sorry Day and Australia Day – on 26 January, and here on the shores of Aotearoa it is Waitangi Day (6 February). Both days commemorate historic events, Australia on the day the land was invaded by those who refused to acknowledge it was already occupied; and for us here, the day the Treaty was signed at Waitangi in 1840. In between these significant markers of history sits HART. It is a story that is perfectly timed to come to us. As Indigenous Australians and their allies called for sovereignty this year, news of the rallies swept across the media – people took to the streets in the thousands and shared their stories, their memories, their ongoing experiences of the institutionalised racism and discrimination that continues today in 2016. Into this space come the personal testimonies of four Noongar men from Western Australia and their stories as survivors of the Stolen Generations. This was the legacy of a systematic and deliberate system of forced removal of children from their families; a series of policies that began in 1869 and continued right until the 1970s. According to the Bringing Them Home Report, 10-33% of all Aboriginal children were removed, one in ten suffered physical and sexual abuse (not including the numbers who suffered psychological and emotional trauma) and authorities failed to protect these children. Under international law (from 1946) these policies amount to genocide but that recognition is neither visible in public discourse nor in mainstream conversations. In fact, post the seventies, while the policies slowly began to dissolve (although the residue continues today), there continues to be a widespread indifference and an invisibility in public forums that cloaks a shameful chapter in Australia’s past. This history is important because even though our Indigenous Australians are our brothers and sisters ‘across the ditch’, there are many in New Zealand who do not know this story or how deeply it seeps into the soil of the soul. It is into this space that Ian Michael shares these testimonies. Quietly and with profound dignity, these stories are told in the words of their narrators and the result is both powerful and poignant. It is verbatim theatre, following a history of other classics such as Jane Harrison’s Stolen and Ilbijerri and Belvoir’s production of Coranderrk. Stylistically simple, HART uses a set of projected images, voice-overs (including excerpts from Kevin Rudd’s 2008 apology) a single chair and Michael as the solo performer who re-tells these stories. The performance operates not only in the sense of simply a ‘show’ but in performing versions of oneself. Michael explains his own story is part of the quartet of testimonies and that occasionally it may seem confusing as the stories segue. It doesn’t, as we all know, inevitably matter – this is not just about the stories on stage but the healing for the community. Watching Michael perform I slip away from my seat in the Basement’s studio and am among my friends and those I consider family in Australia; I hear the audience collectively talk-back as Michael speaks, supporting and cheering; I feel the tears slide down the cheeks of women sitting next to me, and hands that slip into mine. I remember the community as the audience are also witnesses; like the performer they too are playing an active part in the ongoing and much larger narrative of centering Indigenous voices and history. Perhaps this touring version has been truncated, stripped back, and aims to be both educational and personal – all these are valid and necessary goals but there deserves to be more. There is latent potency in Michael’s performance, beneath the congenial narration, that promises to give far more depth but in this 60-minute show it often feels we only skim the surface of what has so much more potential. Both Michael and co-writer Seanna van Helten have created a fluid narrative around the stories of these four men, touching and vivid – yet as a narrative there are layers left unexplored. The direction by Penny Harpham is predictable and within the intimacy of the tiny space some beautifully personal moments are achieved. However, it feels more akin to a storytelling session than a crafted work of theatre with shape and arcs that go beyond the expected structure of the confessional narrative. Costume, light and sound design (Chloe Greaves, Shannah McDonald and Raya Slavin respectively) all work easily together; the collective curation is simple and functions well for the space and purpose. Michael Carmody’s projection works extremely well as a frame for these vignettes and Gabi Briggs’ photography are visual narratives in themselves. HART is a powerful work and Michael is an incredibly talented performer. If you know little about the stories of our Indigenous cousins who were survivors of the Stolen Generations then this is definitely a play that you need to see. 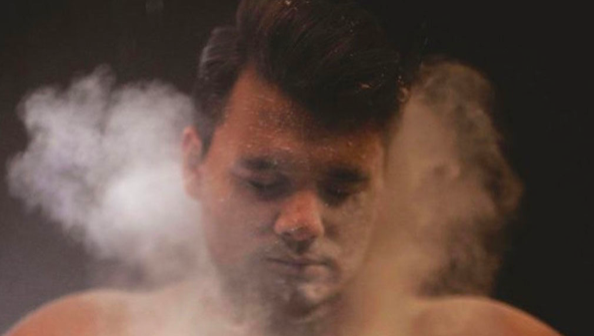 If you do know and are familiar with this history then equally get along to tautoko a very talented performer and support Indigenous Australian theatre – because these stories deserve to be told but more importantly they need to be heard.